Francois Blaquart has been suspended from his post as technical director of the French Football Federation following shocking allegations about alleged quotas limiting the presence of non-white players in France’s national team. French website Mediapart alleged plans were made at an FFF meeting last November to limit the numbers of black players and those of north African origin entering national training centres and academies at the age of 12. Mediapart has also published an alleged transcript of part of the meeting. France head coach Laurent Blanc, Under-21 head coach Erick Mombaerts and Blaquart were all said to have attended the meeting. Blanc denied the claims, but if Blaquart’s suspension is a sign, then old ‘Larry White’ may also be headed to the guillotine, denial or no denial. 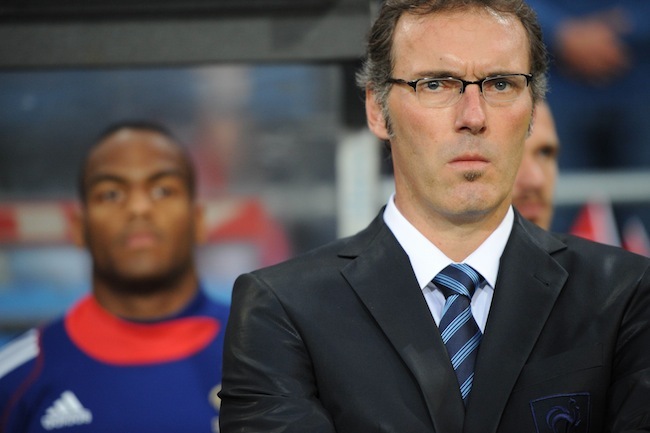 Blanc told L’Equipe today: “This project does not exist. All that, for me, is false. Of course it’s a shocking allegation, and if it’s true it’s utterly reprehensible, but this is – let’s not beat around the bush – the French we’re talking about. The French. Ahem. Anyway, watch zis space. so ridiculous to call it racism when they just want to get more French footballers, its not about race its about nationality, its moronic to train a bunch of players who might end up representing another country! And even if the players with second nationality goes on to represent France some of them does not share the same passion for France as the French nationals. We all know of the affirmative action scheme. In my opinion, this should apply to all sports as well as businesses, including soccer. After all, some of the world’s best soccer players are of African descent: Maurice Edu, Jozy Altidore, Oguchi Onyewu, Thierry Henry, Roberto Carlos, and Didier Drogba to name a few. Let’s kick this cancer out of the game we love so dearly: soccer. I won’t even try to explain to you how stupid that quote is. “And even if the players with second nationality goes on to represent France some of them does not share the same passion for France as the French nationals.” Again, you’re an idiot. the same passion for france as the french nationals? the same french nationals that were in the french national team last world cup? Mediapart are making too much noise just to sell more. Actually if you don’t just read Mediapart’s outrageous titles, you’ll learn that France’s coaches were talking about the fact that several young players trained in France and playing for french’s young teams and decide thereafter to play for another country. The other fact they were talking about is that training centres are focused in a typical profile (i.e athletic players, Blanc said in the meeting that most of them are blacks) at the expense of smaller, or more technical players. Would we be even talking about this if the players concerned were not from african descent, but some other european country? I don’t think so. That’s not racist. Pas du tout. @Soccer Professional: You’re the worst troll I’ve seen in a while. Also, I agree with Dusan Zorovic. First of all, lets get the facts straighten out… Children and teens of all races who are citizens of a country should be given the chance to play the game they love, and if they are good enough, they should then be accordingly picked based on their talents, and not some irrational fear that 12-15 year old children will become future traitors. You CANNOT justify the exclusion of blacks as well as those of arab or turkish descent from the places where they learn how to play football, when they are good enough to be there. The bigwigs might try to spin as best as they can, but there is no way that this isn’t an indication of officially-sanctioned institutional racism. Sure, everyone should be given an equal chance to play, but, affirmative action is not a matter of an equal playing field but ‘making’ up for repression. Thus, people of race under the affirmative action plan have a higher chance of success than anyone else, even if they are inept and incapable. That is ridiculous, Mr Montesquieu. Give me an example of a player brought into an international squad because he is not white. In the French situation alone, Zinedine Zidane, the best player in the world and twice commanding world record transfer fees, north african. Marcel Desailly, one of the best centre backs to play football for France, of ghanaian descent. Thierry Henry, one of the forwards to grace the premier league, black. David trezeguet, who won France Euro 2000, black. Happless players? When was the last time you saw a player who was black and thought he’s only there coz of his race? Affirmative action, a good thing to redress the imbalance of before and the disadvantages those imbalances still cause, is not in football. Players are picked for teams because the teams want to win. This is simply an example of the fickleness that exists when it comes to race and french football. When they won the world cup in 1998 and the euros in 2002 with Zidane, Henry, Trezeguet, Thuram etc, it was a triumph of multiculturalism and now they performed poorly in the 2010 world cup, it is the fault of the non white players. Is it me or are the french getting more and more Racist/Fascists/Islamaphobic? @Soccer professional – You are a Noob, You just named 3 average american footballers who have never made it in any big league? How are they “world’s best soccer players”? Also I’m pretty sure Roberto carlos has no African Heritage. Shane, jojo, I guess neither of you saw the lack of heart the world cup squad had and it consisted mostly of players with other than french background, with Anelka and Evra recieving the longest bans, hm, I wonder why? Australia have been losing australian born and trained players to other countries because of dual nationality for years. Its unfortunate but its a fact of football in multicultural nations. if we were to ban dual nationality players from playing in australia we would be stuffed! There seems that there is a resurgence of nationalism in france, of course every country wants to blame someone when they do poorly at the world cup, but placing a quota on players of any race, is a disgrace and would only go on to create division and a poorer national team. If you want to alienate minorities in france further this is definitely the way to do it. Take away football from the kids, give them no hope, its this type of short-sightedness that ruins countries. I’m sure Montesquieu is being ironic. Affirmative action in this case would be to make up for the past repression of white people?!? Also, Anelka does not have “other than French ancestry” I’m not sure what that can possibly mean other than being black. The most heavily criticized play was Ribery, who is unquestionably “white,” though a a Muslim and Ch’ti, which I guess makes him a minority. And speaking as a binational French person, I find the whole “problem” to be ridiculous. Am I to understand the because Marouane Chamakh and Moussa Sow decided to play for Tunisia and Senegal, then the French youth training system should not accept the next Zidane? Hilariously ignorant. Dusan Zorovic,according to your name you must be a balkan one.The balkan countries are known for their extreme racism because they live in their own small world.Who do you think made france world champion?? Yes,African players.The best of them was Zidan,a north African. Look at france of the 80ies.There were almost no African players at the national team.And did they have success?No!.France should thank God that they have African players.Thats the only way to compete with countries like Brazil And Argentine. So stop the hypocrisie to pretend to be better of with a solution that will never bring success. But of course. It is the French way. The World Cup was an absolute fiasco, the national program is in shambles. The only sensible course of action is to blame the “foreigners” – the very young, non-white players who would likely improve French sport in the future. If I were a racist football manager, I would do the same. Job Security. Also, France didn’t establish a colonial empire, only to have the most gifted players from its former colonies opt to play under the flag of the nation of their birth, upon discovering that in France, the managers are nationalist, racist assholes. It is analogous to the other French pastime – the Tour de France. If a Frenchman cannot win fairly, then obviously the rules must be changed to ensure that it illegal for a non-Frenchman to win. Because only Frenchmen know how to ride bicycles!!! It goes without saying that the French football establishment is racist and nationalist, which is pathetic, considering the success of Les Bleus in the past. Fortunately, the football machine is brutally efficient when it comes to issues of nationality and race. We’ve seen the last of Lest Bleus in World Cup competition in our lifetimes. To that fool Dusan and the other French people on here chatting rubbish. Zidane your best player since Platini is from ALGERIAN descent. Your best players now are probably Nasri and Benzema = from ALGERIAN descent. Your best players in the last 15 years Henry, Desailly, Vieira, Makelele, Anelka, are all from AFRICAN or CARIBBEAN descent. If they all played for their other countries you wouldnt have a team. LOOOL just found out as well that PLATINI’s father is Italian. You french jokas. I think you should check where your from yourselves.